In the comic within the comic, it’s simply gosh jolly fun! 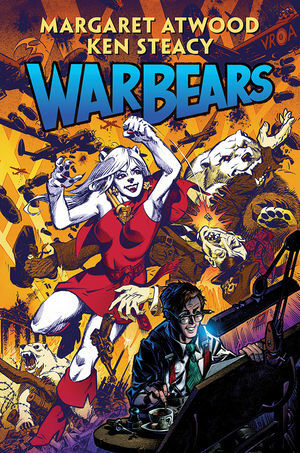 I would love to read spinoff with only this were-bear. I imagine they would be told in a four-panel newspaper strip format than a full-on comic, but either can work. Sadly, the modern day public demand for the pulps is not as good these days. There were attempts to revitalize in the cinema front, and most fell flat. I’m thankful that at least in the print front, this format is not gone. Atwood’s story hits the tooth to the nail with her examination of the publishing industry as planes continue to raze Europe as World War II continued. The commentary about the war is light enough for some to notice but the key to the comic within the comic is a different approach at understanding patriotism. Just how Al remained optimistic throughout the series is nicely revealed as he never felt totally tossed to the fire. Steacy’s artwork is simply immaculate. I said it before and I will say it again, Oursonette is cute as a button! Some comparisons can be made to the movie Chaplin, where Al, the real hero, finally gets the recognition he deserves. Although readers are only teased with moments of the work Zurakowski created, the stories had an impact. The respect heroes and comics made in Canada deserves to be noted. Atwood’s a consummate storyteller. She made sure we connect with the characters and although we have not lived through those times, it feels like I had. Whether this book gets an Eisner nomination when San Diego Comic-Con takes place, that remains to be seen. ← To Wax Philosophy or Sociology in A Silent Voice, Where Forth Art Thou?